Jollibee makes kids’ playtime more exciting with fun music from the Jolly Musical Band that comes with every Jolly Kiddie Meal. 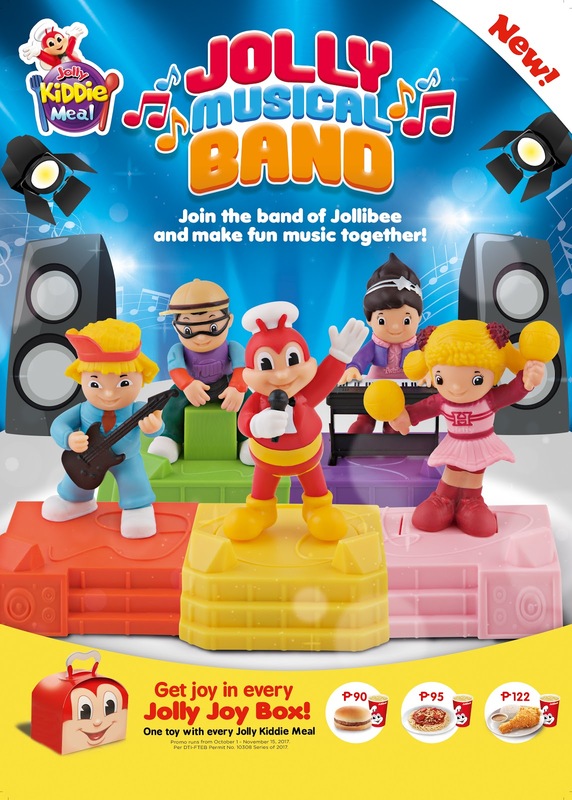 Kids can enjoy jamming with Jollibee and Friends by simply collecting and connecting the toys to form the stage, assemble the band, and see performance-ready Jollibee, Hetty, Popo, Twirlie, and Yum with their instruments. Simply push each of the collectibles to the left or to the right to see some of their awesome concert moves. See and hear Jollibee sway and sing sweet melodies while Hetty dances and shakes her maracas. Watch as Popo strums the strings of his guitar and Twirlie hits the ivories on her piano, all while Yum adds some cool percussion with his beat box. Get the Jolly Musical Band toys with every purchase of a Jolly Kiddie Meal. For a Yumburger Meal at P90, a Jolly Spaghetti Meal at P95, or a Chickenjoy Meal at P122, kids can get these great toys all with their own Jolly Joy Box. Promo runs from October 1 to November 15, 2017. Visit the nearest Jollibee branch and complete the Jolly Kiddie Meal Jolly Musical Band!